How to Create Customized Music Ringtones for iPhone? 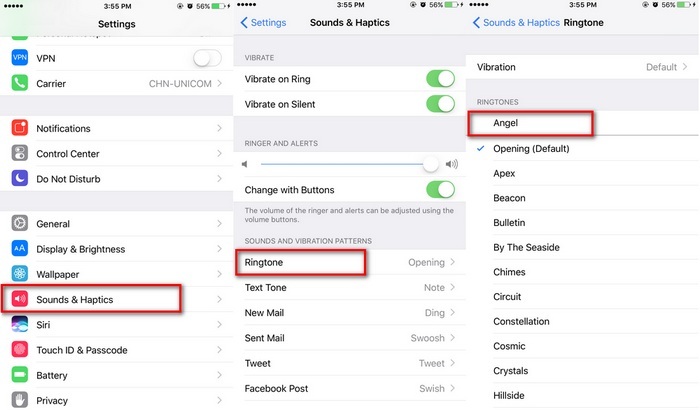 Do you want to have a customized ringtone for your iPhone? There was a time when ringtones were used for the sole purpose of notifying people. Nowadays, the function of ringtones is more than just notifying. It can be used to impress others. There are numerous sites from where you can get free music ringtones for iPhone. Most of these sites are full of advertisements and commercials. These ads become irritating and annoying for the users. Moreover, sometimes, you cannot get the best music ringtones for iPhone. This is why it is better to create customized ringtones. In this article, we have mentioned the answer to the frequently asked question, "how to get music ringtone for iPhone?" Read on to know how you can get music ringtone for your iPhone. Part 1: How to Turn Your Favorite Music into a Ringtone? Every iPhone user used iTunes to turn their favorite music into a ringtone. However, it is not possible anymore as in the latest update of iTunes tones are hidden. An easy and hassle-free way to create your own ringtone is by using iMyFone TunesMate. 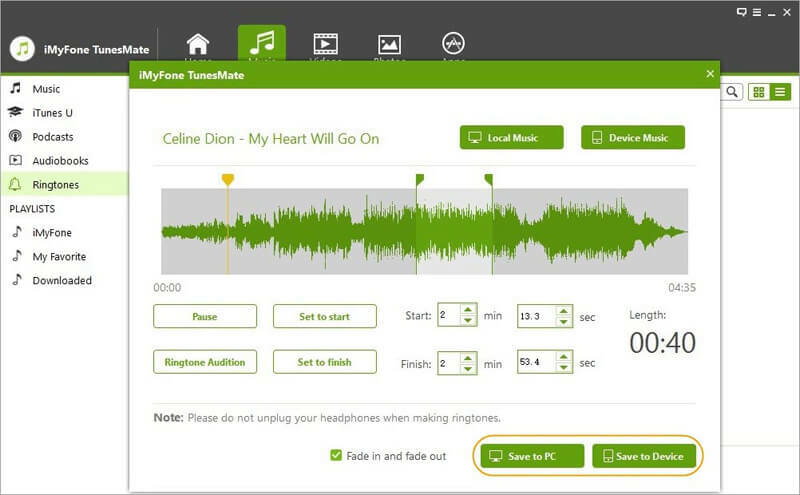 iMyFone TunesMate is a piece of amazing software that allows you to turn your favorite music into a ringtone for iPhone. 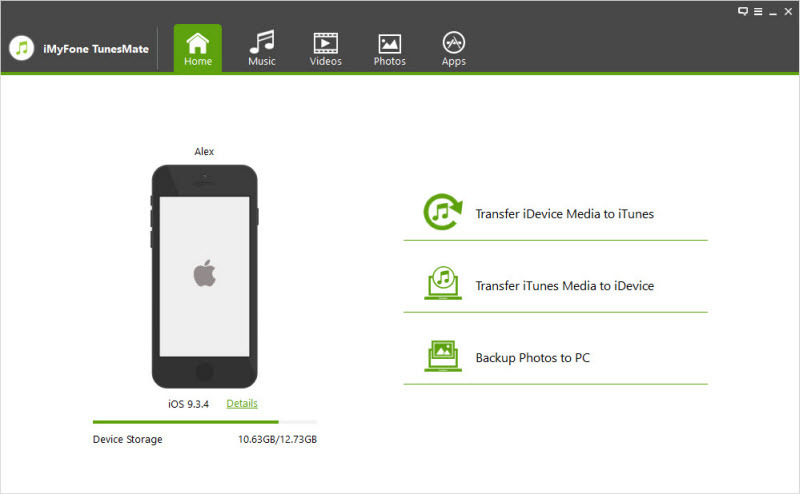 It is also a great file manager that lets you exchange data between your PC and iPhone. This manager enables you to have a back up of your phone files on your computer. 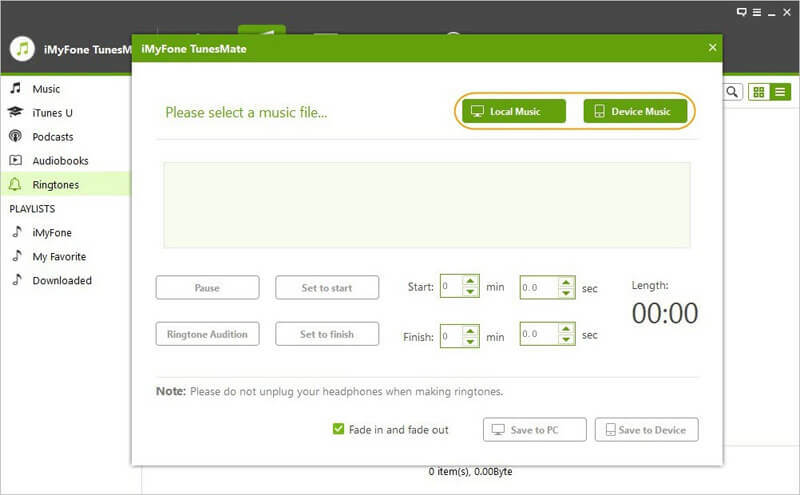 The function of iMyFone TunesMate is not restricted to these, and it will help you manage apps on your phone. Have a look at the features of iMyFone TunesMate. 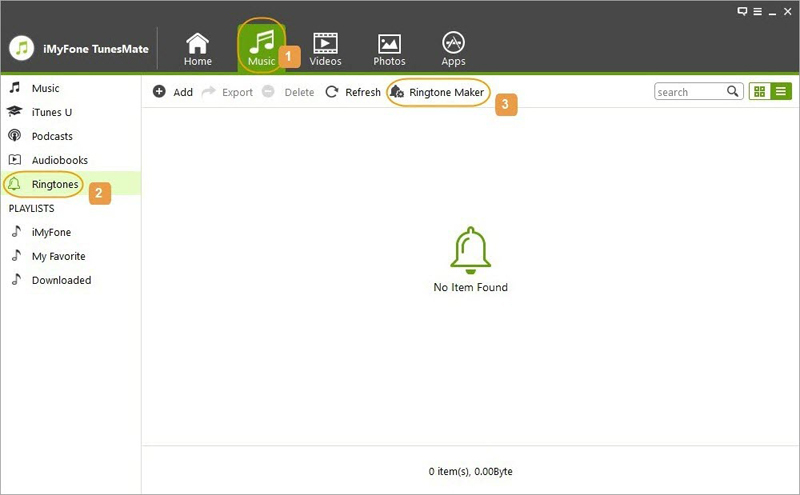 Allows you to select songs from your device or computer for setting as ringtone. Allows you to create a ringtone up to 40-second length by manually setting start and finish point. Allows you to preview ringtone content before saving it into your device or computer. Easily transfers ringtones from iPhone to iTunes/computer, or from iTunes/computer to iPhone. Helps in converting incompatible files before moving them to your iPhone. Step 1Open iMyFone TunesMate on your PC and keep your iPhone connected to the computer. Step 2Click on the "Music" tab located at the top of the screen, choose "Ringtone" from the left side bar, and choose "Ringtone Maker" at the sub-menu. Step 3Select your iPhone music by clicking "Device Music". Step 4Set start and finish point of ringtone by clicking "Set to start" and "Set to finish" once the music is loaded for processing. Step 5After you have completed the editing, you can save created ringtone to your iPhone by clicking "Save to Device". First, on your iPhone, go to the “Settings”. After that, open “Sounds” or “Sounds & Haptics”. There will be a list of custom ringtones before default ringtones. Preview the ringtone you wish to set. Select the ringtone you want to use. Every day there is a new music to ringtone app for iPhone coming out. This makes it difficult to choose a reliable and simple app. It is the reason why you should use a website to get free music ringtones for iPhone. We have listed the top site to download ringtones. One of the top sites to download music ringtones for iPhone is Mobile9. You will have to create an account before you can download the ringtones. There are no subscription charges for creating an account. This is to provide you a safe access to the site for downloading free ringtones and wallpapers. Mad Ringtones has over 300,000 free ringtones for iPhone users. If you can’t find a good ringtone, you can create your own ringtone in 3 easy steps and share with your friends. Another great website to get free ringtone is Myxer. There are several ringtones that iPhone users can download. Some of the ringtones are paid while some are free for downloading. Additionally, you can download videos, games, apps, images, and music. This site allows you to download plenty of ringtone for iPhone. For the convenience of users, there are categories of ringtones that make it easy to search for ringtones. Free Ringtone enables you to make ringtones of your choice as well. This site is developed, especially for iPhone users. This enables you to download free ringtones for your iPhone. There are numerous ringtones that you can download along with wallpapers and alarm tones.